I owe the discovery of Uqbar to the conjunction of a mirror and an encyclopedia. The mirror troubled the depths of a corridor in a country house on Gaona Street in Ramos Mejia; the encyclopedia is fallaciously called The Anglo-American Cyclopaedia (New York, 1917) and is a literal but delinquent reprint of the Encyclopedia Britannica of 1902. The event took place some five years ago. Bioy Casares had had dinner with me that evening and we became lengthily engaged in a vast polemic concerning the composition of a novel in the first person, whose narrator would omit or disfigure the facts and indulge in various contradictions which would permit a few readers—very few readers—to perceive an atrocious or banal reality. From the remote depths of the corridor, the mirror spied upon us. We discovered (such a discovery is inevitable in the late hours of the night) that mirrors have something monstrous about them. Then Bioy Casares recalled that one of the heresiarchs of Uqbar had declared that mirrors and copulation are abominable, because they increase the number or men. I asked him the origin of this memorable observation and he answered that it was reproduced in The Anglo-American Cyclopaedia, in its article on Uqbar. The house (which we had rented furnished) had a set of this work. On the last pages of Volume XLVI we found an article on Upsala; on the first pages of Volume XLVII, one on Ural-Altaic Languages, but not a word about Uqbar. Bioy, a bit taken aback, consulted the volumes of the index. In vain he exhausted all of the imaginable spellings: Ukbar, Ucbar, Ooqbar, Ookbar, Oukbahr . . . . Before leaving, he told me that it was a region of Iraq or Asia Minor. I must confess that I agreed with some discomfort. I conjectured that this undocumented country and its anonymous heresiarch were a fiction devised by Bioy’s modesty in order to justify a statement. The fruitless examination of one of Justus Perthes’ atlases fortified my doubt. The following day, Bioy called me from Buenos Aries. He told me he had before him the article on Uqbar, in volume XLVI of the encyclopedia. The heresiarch’s name was not forthcoming, but there was a note on his doctrine, formulated in words almost identical to those he had repeated, though perhaps literally inferior. He had recalled: Copulation and mirrors are abominable. The text of the encyclopedia said: For one of those gnostics, the visible universe was an illusion or (more precisely) a sophism. Mirrors and fatherhood are abominable because they multiply and disseminate that universe. I told him, in all truthfulness, that I should like to see that article. A few days later he brought it. This surprised me, since the scrupulous cartographical indices of Ritter’s Erdkunde were plentifully ignorant of the name Uqbar. We read the article with some care. The passage recalled by Bioy was perhaps the only surprising one. The rest of it seemed very plausible, quite in keeping with the general tone of the work and (as is natural) a bit boring. Reading it over again, we discovered beneath its rigorous prose a fundamental vagueness. Of the fourteen names which figured in the geographical part, we only recognized three—Khorasan, Armenia, Erzerum—interpolated in the text in an ambiguous way. Of the historical names, only one: the impostor magician Smerdis, invoked more as a metaphor. The note seemed to fix the boundaries of Uqbar, but its nebulous reference points were rivers and craters and mountain ranges of that same region. We read, for example, that the lowlands of Tsai Khaldun and the Axa Delta marked the southern frontier and that on the islands of the delta wild horses procreate. All this, on the first part of page 918. In the historical section (page 920) we learned that as a result of the religious persecutions of the thirteenth century, the orthodox believers sought refuge on these islands, where to this day their obelisks remain and where it is not uncommon to unearth their stone mirrors. The section on Language and Literature was brief. Only one trait is worthy of recollection: it noted that the literature of Uqbar was one of fantasy and that its epics and legends never referred to reality, but to the two imaginary regions of Mlejnas and Tlön. . . . The bibliography enumerated four volumes which we have not yet found, though the third—Silas Haslam: History of the Land Called Uqbar, 1874—figures in the catalogs of Bernard Quartich’s book shop. The first, Lesbare und lesenswerthe Bemerkungen uber das Land Ukkbar in Klein-Asien, dates from 1641 and is the work of Johannes Valentinus Andrea. This fact is significant; a few years later, I came upon that name in the unsuspected pages of De Quincey (Writings, Volume XIII) and learned that it belonged to a German theologian who, in the early seventeenth century, described the imaginary community of Rosae Crucis—a community that others founded later, in imitation of what he had prefigured. That night we visited the National Library. In vain we exhausted atlases, catalogs, annuals of geographical societies, travelers’ and historians’ memoirs: no one had ever been in Uqbar. Neither did the general index of Bioy’s encyclopedia register that name. The following day, Carlos Mastronardi (to whom I had related the matter) noticed the black and gold covers of theAnglo-American Cyclopaedia in a bookshop on Corrientes and Talcahuano. . . . He entered and examined Volume XLVI. Of course, he did not find the slightest indication of Uqbar. Some limited and waning memory of Herbert Ashe, an engineer of the southern railways, persists in the hotel at Adrogue, amongst the effusive honeysuckles and in the illusory depths of the mirrors. In his lifetime, he suffered from unreality, as do so many Englishmen; once dead, he is not even the ghost he was then. He was tall and listless and his tired rectangular beard had once been red. I understand he was a widower, without children. Every few years he would go to England, to visit (I judge from some photographs he showed us) a sundial and a few oaks. He and my father had entered into one of those close (the adjective is excessive) English friendships that begin by excluding confidences and very soon dispense with dialog. They used to carry out an exchange of books and newspapers and engage in taciturn chess games. . . . I remember him in the hotel corridor, with a mathematics book in his hand, sometimes looking at the irrecoverable colors of the sky. One afternoon, we spoke of the duodecimal system of numbering (in which twelve is written as 10). Ashe said that he was converting some kind of tables from the duodecimal to the sexagesimal system (in which sixty is written as 10). He added that the task had been entrusted to him by a Norwegian, in Rio Grande du Sul. We had known him for eight years and he had never mentioned staying in that region. . . . We talked of country life, of the capangas, of the Brazilian etymology of the wordgaucho (which some old Uruguayans still pronounce gaúcho) and nothing more was said—may God forgive me—of duodecimal functions. In September of 1937 (we were not at the hotel), Herbert Ashe died of a ruptured aneurysm. A few days before, he had received a sealed and certified package from Brazil. It was a book in large octavo. Ashe left it at the bar, where—months later—I found it. 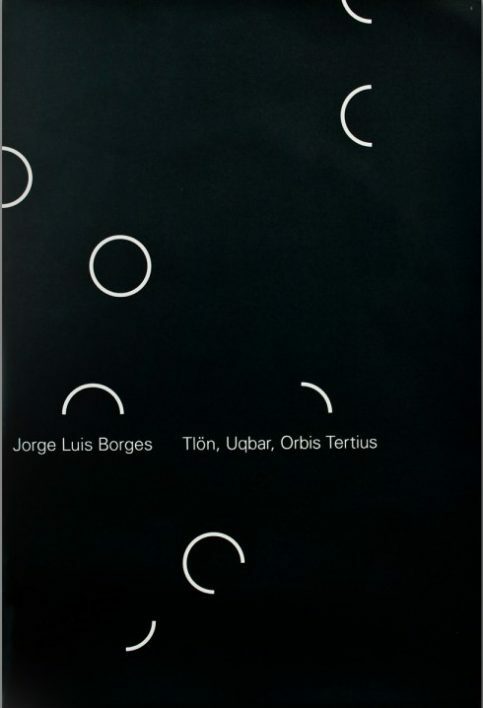 I began to leaf through it and experienced an astonished and airy feeling of vertigo which I shall not describe, for this is not the story of my emotions but of Uqbar and Tlön and Orbis Tertius. In the Islamic world, there is one night, called the Night of Nights, when the secret doors of heaven open wide and the water in the jars becomes sweeter; if those doors opened, I would not feel what I felt that afternoon. The book was written in English and contained 1001 pages. On the yellow leather back I read these curious words which were repeated on the title page: A First Encyclopedia of Tlön. Vol. XI. Hlaer to Jangr. There was no indication of date or place. On the first page and on a leaf of silk paper that covered one of the color plates there was stamped a blue oval with this inscription: ORBIS TERTIUS. Two years before I had discovered, in a volume of a certain pirated encyclopedia, a superficial description of a nonexistent country; now chance afforded me something more precious and arduous. Now I held in my hands a vast methodical fragment of an unknown planet’s entire history, with its architecture and its playing cards, with the dread of its mythologies and the murmur of its languages, with its emperors and its seas, with its minerals and its birds and its fish, with its algebra and its fire, with its theological and metaphysical controversy. And all of it articulated, coherent, with no visible doctrinal intent or tone of parody. In the “Eleventh Volume” which I have mentioned, there are allusions to preceding and succeeding volumes. In an article in the N. R. F. which is now classic, Nestor Ibarra has denied the existence of those companion volumes; Ezequiel Martinez Estrada and Drieu La Rochelle have refuted that doubt, perhaps victoriously. The fact is that up to now the most diligent inquiries have been fruitless. In vain we have upended the libraries of the two Americas and of Europe. Alfonso Reyes, tired of these subordinate sleuthing procedures, proposes that we should all undertake the task of reconstructing the many and weighty tomes that are lacking:ex ungue leonem. He calculates, half in earnest and half jokingly, that a generation of Tlönistas should be sufficient. This venturesome computation brings us back to the fundamental problem: Who are the inventors of Tlön? The plural is inevitable, because the hypothesis of a lone inventor—an infinite Leibniz laboring away darkly and modestly—has been unanimously discounted. It is conjectured that this brave new world is the work of a secret society of astronomers, biologists, engineers, metaphysicians, poets, chemists, algebraists, moralists, painters, geometers. . . . directed by an obscure man of genius. Individuals mastering these diverse disciplines are abundant, but not so those capable of inventiveness and less so those capable of subordinating that inventiveness to a rigorous and systematic plan. This plan is so vast that each writer’s contribution is infinitesimal. At first it was believed that Tlön was a mere chaos, and irresponsible license of the imagination; now it is known that is a cosmos and that the intimate laws which govern it have been formulated, at least provisionally. Let it suffice for me to recall that the apparent contradictions of the Eleventh Volume are the fundamental basis for the proof that the other volumes exist, so lucid and exact is the order observed in it. 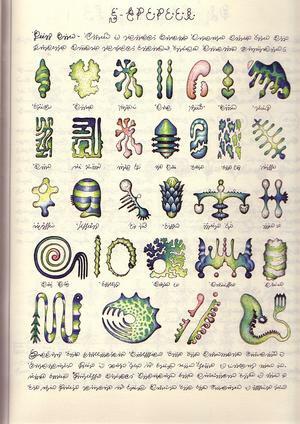 The popular magazines, with pardonable excess, have spread news of the zoology and topography of Tlön; I think its transparent tiger and towers of blood perhaps do not merit the continued attention of all men. I shall venture to request a few minutes to expound its concept of the universe. Hume noted for all time that Berkeley’s arguments did not admit the slightest refutation nor did they cause the slightest conviction. This dictum is entirely correct in its application to the earth, but entirely false in Tlön. The nations of this planet are congenitally idealist. Their language and the derivations of their language—religion, letters, metaphysics—all presuppose idealism. The world for them is not a concourse of objects in space; it is a heterogeneous series of independent acts. It is successive and temporal, not spatial. There are no nouns in Tlön’s conjectural Ursprache, from which the “present” languages and the dialects are derived: there are impersonal verbs, modified by monosyllabic suffixes (or prefixes) with an adverbial value. For example: there is no word corresponding to the word moon, but there is a verb which in English would be to moon or to moondle. The moon rose above the river is hlör u fang axaxaxas mlö, or literally: upward behind the onstreaming it moondled. The preceding applies to the languages of the southern hemisphere. In those of the northern hemisphere (on whose Ursprache there is very little data in the Eleventh Volume) the prime unit is not the verb, but the monosyllabic adjective. The noun is formed by an accumulation of adjectives. They do not say moon, but rather round airy-light on dark or pale-orange-of-the-sky or any other such combination. In the example selected the mass of adjectives refers to a real object, but this is purely fortuitous. The literature of this hemisphere (like Meinong’s subsistent world) abounds in ideal objects, which are invoked and dissolved in a moment, according to poetic needs. At times they are determined by mere simultaneity. There are objects composed of two terms, one of visual and another of auditory character: the color of the rising sun and the faraway cry of a bird. There are objects of many terms: the sun and the water on a swimmer’s chest, the vague tremulous rose color we see with our eyes closed, the sensation of being carried along by a river and also by sleep. These second-degree objects can be combined with others; through the use of certain abbreviations, the process is practically infinite. There are famous poems made up of one enormous word. This word forms a poetic object created by the author. The fact that no one believes in the reality of nouns paradoxically causes their number to be unending. The languages of Tlön’s northern hemisphere contain all the nouns of the Indo-European languages—and many others as well. It is no exaggeration to state that the classic culture of Tlön comprises only one discipline: psychology. All others are subordinated to it. I have said that the men of this planet conceive the universe as a series of mental processes which do not develop in space but successively in time. Spinoza ascribes to his inexhaustible divinity the attributes of extension and thought; no one in Tlön would understand the juxtaposition of the first (which is typical only of certain states) and the second—which is a perfect synonym of the cosmos. In other words, they do not conceive that the spatial persists in time. The perception of a cloud of smoke on the horizon and then of the burning field and then of the half-extinguished cigarette that produced the blaze is considered an example of association of ideas. This monism or complete idealism invalidates all science. If we explain (or judge) a fact, we connect it with another; such linking, in Tlön, is a later state of the subject which cannot affect or illuminate the previous state. Every mental state is irreducible: the mere fact of naming it—i.e., of classifying it—implies a falsification. From which it can be deduced that there are no sciences on Tlön, not even reasoning. The paradoxical truth is that they do exist, and in almost uncountable number. The same thing happens with philosophies as happens with nouns in the northern hemisphere. The fact that every philosophy is by definition a dialectical game, aPhilosophie des Als Ob, has caused them to multiply. There is an abundance of incredible systems of pleasing design or sensational type. The metaphysicians of Tlön do not seek for the truth or even for verisimilitude, but rather for the astounding. They judge that metaphysics is a branch of fantastic literature. They know that a system is nothing more than the subordination of all aspects of the universe to any one such aspect. Even the phrase “all aspects” is rejectable, for it supposes the impossible addition of the present and of all past moments. Neither is it licit to use the plural “past moments,” since it supposes another operation. . . . One of the schools of Tlön goes so far as to negate time: it reasons that the present is indefinite, that the future has no reality other than as a present memory. Another school declares that all time has already transpired and that our life is only the vague and dim memory, no doubt fractured and false, a reflection of an irrecoverable process. Another, that the history of the universe—and in it our lives and the most tenuous detail of our lives—is the scripture produced by a subordinate god in order to communicate with a demon. Another, that the universe is comparable to those cryptographs in which not all the symbols are valid and that only what happens every three hundred nights is true. Another, that while we sleep here, we are awake elsewhere and that in this way every man is two men. On Tuesday, X crosses a deserted road and loses nine copper coins. On Thursday, Y finds in the road four coins, somewhat rusted by Wednesday’s rain. On Friday, Z discovers three coins in the road. On Friday morning, X finds two coins in the corridor of his house. The heresiarch would deduce from this story the reality—i.e., the continuity—of the nine coins which were recovered. It is absurd (he affirmed) to imagine that four of the coins have not existed between Tuesday and Thursday, three between Tuesday and Friday afternoon, two between Tuesday and Friday morning. It is logical to think that they have existed—at least in some secret way, hidden from the comprehension of men—at every moment of those three periods. The language of Tlön resists the formulation of this paradox; most people did not even understand it. The defenders of common sense at first did no more than negate the veracity of the anecdote. They repeated that it was a verbal fallacy, based on the rash application of two neologisms not authorized by usage and alien to all rigorous thought: the verbs to find and to lose, which beg the question, because they presuppose the identity of the first and of the last nine coins. They recalled that all nouns (man, coin, Thursday, Wednesday, rain) have only a metaphorical value. They denounced the treacherous circumstance “somewhat rusted by Wednesday’s rain,” which presupposes what is trying to be demonstrated: the persistence of the four coins from Tuesday to Thursday. They explained that equality is one thing and identity another, and formulated a kind of reductio ad absurdum: the hypothetical case of nine men who on nine nights suffer a severe pain. Would it not be ridiculous—they questioned—to pretend that this pain is one and the same? They said that the heresiarch was prompted only by the blasphemous intention of attributing the divine category of being to some simple coins and that at times he negated plurality and at other times did not. They argued: if equality implies identity, one would also have to admit that the nine coins are one. Unbelievably, these refutations were not definitive. A hundred years after the problem was stated, a thinker no less brilliant than the heresiarch but of orthodox tradition formulated a very daring hypothesis. This happy conjecture affirmed that there is only one subject, that this indivisible subject is every being in the universe and that these beings are the organs and masks of the divinity. X is Y and is Z. Z discovers three coins because he remembers that X lost them; X finds two in the corridor because he remembers that the others have been found. . . . The Eleventh Volume suggests that three prime reasons determined the complete victory of this idealist pantheism. The first, its repudiation of solipsism; the second, the possibility of preserving the psychological basis of the sciences; the third, the possibility of preserving the cult of the gods. Schopenhauer (the passionate and lucid Schopenhauer) formulates a very similar doctrine in the first volume of Parerga und Paralipomena. The geometry of Tlön comprises two somewhat different disciplines: the visual and the tactile. The latter corresponds to our own geometry and is subordinated to the first. The basis of visual geometry is the surface, not the point. This geometry disregards parallel lines and declares that man in his movement modifies the forms which surround him. The basis of its arithmetic is the notion of indefinite numbers. They emphasize the importance of the concepts of greater and lesser, which our mathematicians symbolize as > and <. They maintain that the operation of counting modifies the quantities and converts them from indefinite into definite sums. The fact that several individuals who count the same quantity would obtain the same result is, for the psychologists, an example of association of ideas or of a good exercise of memory. We already know that in Tlön the source of all knowledge is single and eternal. In literary practices the idea of a single subject is also all-powerful. It is uncommon for books to be signed. 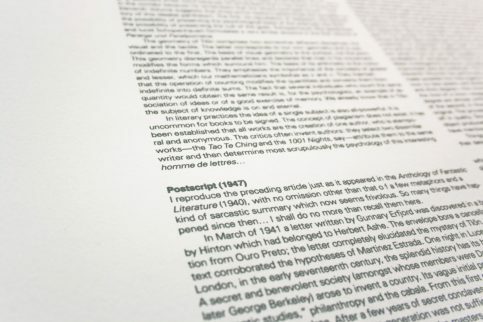 The concept of plagiarism does not exist: it has been established that all works are the creation of one author, who is atemporal and anonymous. 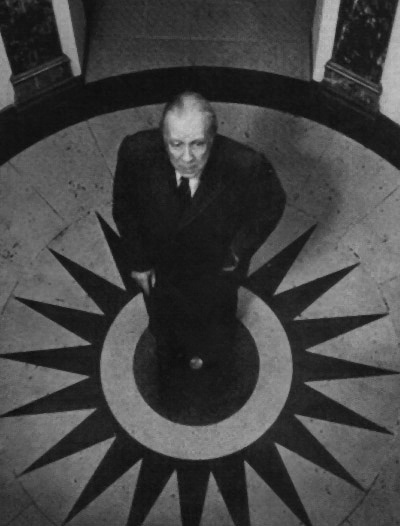 The critics often invent authors: they select two dissimilar works—the Tao Te Ching and The Thousand and One Nights, say—attribute them to the same writer and then determine most scrupulously the psychology of this interesting homme de lettres. . . . Centuries and centuries of idealism have not failed to influence reality. In the most ancient regions of Tlön, the duplication of lost objects is not infrequent. Two persons look for a pencil; the first finds it and says nothing; the second finds a second pencil, no less real, but closer to his expectations. These secondary objects are called hrönir and are, though awkward in form, somewhat larger than the originals. Until recently, the hrönir were the accidental products of distraction and forgetfulness. It seems unbelievable that their methodical production has been going on for a hundred years, but this is what the Eleventh Volume tells us. The first efforts were unsuccessful. However, the modus operandi merits description. The director of one of the state prisons told his inmates that there were certain tombs in an ancient river bed and promised freedom to whoever might make an important discovery. During the months preceding the excavation the inmates were shown photographs of what they were to find. This first effort proved that expectation and hope can be inhibitory; a week’s work with pick and shovel did not mange to unearth anything in the way of a hrön except a rusty wheel of a period posterior to the experiment. But this was kept in secret and the process was repeated later in four colleges. In three of them failure was almost complete; in a fourth (whose director died accidentally during the first excavations) the students unearthed—or produced—a gold mask, an archaic sword, two or three clay urns and the moldy and mutilated torso of a king whose chest bore an inscription which it has not yet been possible to decipher. Thus was discovered the unreliability of witnesses who knew of the experimental nature of the search. . . . Mass investigations produce contradictory objects; now, individual, and as far as possible spontaneous, jobs are preferred. The methodical fabrication of hrönir (says the Eleventh Volume) has performed prodigious services for archaeologists. It has made possible the interrogation and even the modification of the past, which is now no less malleable and docile than the future. Curiously, the hrönir of second and third degree—the hrönir derived from another hrön, those derived from the hrön of a hrön—exaggerate the flaws of the initial one; those of fifth degree are almost uniform; those of ninth degree become confused with those of the second; and those of the eleventh have a purity of form not found in the original. The process is cyclical: the hrön of the twelfth degree begins to fall off in quality. Stranger and more pure than any hrön is, at times, the ur: the object produced through suggestion, brought into being by hope. The great golden mask I have mentioned is an illustrious example. Things duplicate themselves in Tlön; they also tend to become effaced and lose their details when they are forgotten. A classic example is the doorway which survived as long it was visited by a beggar and disappeared at his death. At times, some birds, or perhaps a horse, have saved the ruins of an amphitheater. I reproduce the preceding article just as it appeared in the Anthology of Fantastic Literature(1940), with no omission other than that of a few metaphors and a kind of sarcastic summary which now seems frivolous. So many things have happened since then. . . . I shall do no more than recall them here. In March of 1941 a letter written by Gunnary Erfjord was discovered in a book by Hinton which had belonged to Herbert Ashe. The envelope bore a cancellation from Ouro Preto; the letter completely elucidated the mystery of Tlön. Its text corroborated the hypotheses of Martinez Estrada. One night in Lucerne or in London, in the early seventeenth century, the splendid history has its beginning. A secret and benevolent society (amongst whose members were Dalgarno and later George Berkeley) arose to invent a country. Its vague initial program included “hermetic studies,” philanthropy and the cabala. From this first period dates the curious book by Andrea. After a few years of secret conclaves and premature syntheses it was understood that one generation was not sufficient to give articulate form to a country. They resolved that each of the masters should elect a disciple who would continue his work. This hereditary arrangement prevailed; after an interval of two centuries the persecuted fraternity sprang up again in America. In 1824, in Memphis (Tennessee), one of its affiliates conferred with the ascetic millionaire Ezra Buckley. The latter, somewhat disdainfully, let him speak—and laughed at the plan’s modest scope. He told the agent that in America it was absurd to invent a country and proposed the invention of a planet. To this gigantic idea he added another, a product of his nihilism: that of keeping the enormous enterprise a secret. At that time the twenty volumes of the Encyclopaedia Britannica were circulating in the United States; Buckleyy suggested that a methodical encyclopedia of the imaginary planet be written. He was to leave them his mountains of gold, his navigable rivers, his pasture lands roamed by cattle and buffalo, his Negroes, his brothels and his dollars, on one condition: “The work will make no pact with the impostor Jesus Christ.” Buckley did not believe in God, but he wanted to demonstrate to this nonexistent God that mortal man was capable of conceiving a world. Buckley was poisoned in Baton Rouge in 1828; in 1914 the society delivered to its collaborators, some three hundred in number, the last volume of the First Encyclopedia of Tlön. The edition was a secret one; its fourty volumes (the vastest undertaking ever carried out by man) would be the basis for another more detailed edition, written not in English but in one of the languages of Tlön. 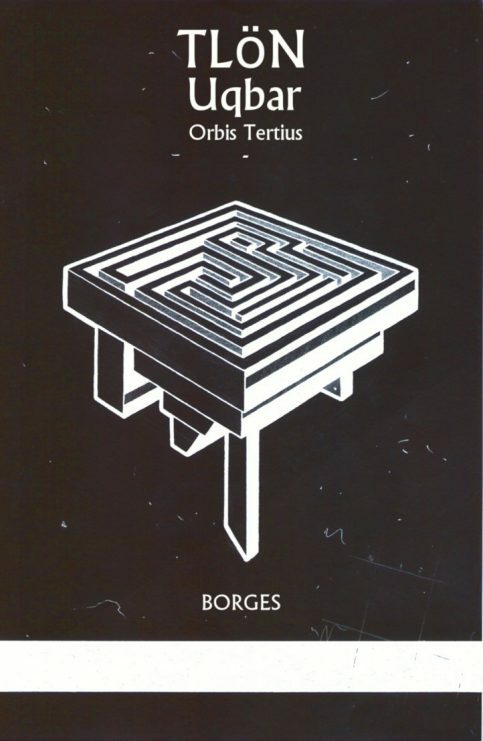 This revision of an illusory world, was called, provisionally, Orbis Tertius and one of its modest demiurges was Herbert Ashe, whether as an agent of Gunnar Erfjord or as an affiliate, I do not know. His having received a copy of the Eleventh Volume would seem to favor the latter assumption. But what about the others? In 1942 events became more intense. I recall one of the first of these with particular clarity and it seems that I perceived then something of its premonitory character. It happened in an apartment on Laprida Street, facing a high and light balcony which looked out toward the sunset. Princess Faucigny Lucinge had received her silverware from Pointiers. From the vast depths of a box embellished with foreign stamps, delicate immobile objects emerged: silver from Utrecht and Paris covered with hard heraldic fauna, and a samovar. Amongst them—with the perceptible and tenuous tremor of a sleeping bird—a compass vibrated mysteriously. The princess did not recognize it. Its blue needle longed from magnetic north; its metal case was concave in shape; the letters around its edge corresponded to one of the alphabets of Tlön. Such was the first intrusion of this fantastic world into the world of reality. I am still troubled by the stroke of chance which made me witness of the second intrusion as well. It happened some months later, at a country store owned by a Brazilian in Cuchilla Negra. Amorim and I were returning from Sant’ Anna. The River Tacuarembo had flooded and we were obliged to sample (and endure) the proprietor’s rudimentary hospitality. He provided us with some creaking cots in a large room cluttered with barrels and hides. We went to bed, but were kept from sleeping until dawn by the drunken ravings of an unseen neighbor, who intermingled inextricable insults with snatches of milongas—or rather with snatches of the same milonga. As might be supposed, we attributed this insistent uproar to the store owner’s fiery cane liquor. By daybreak, the man was dead in the hallway. The roughness of his voice had deceived us: he was only a youth. In his delirium a few coins had fallen from his belt, along with a cone of bright metal, the size of a die. In vain a boy tried to pick up this cone. A man was scarcely able to raise it from the ground. It held in my hand for a few minutes; I remember that its weight was intolerable and that after it was removed, the feeling of oppressiveness remained. I also remember the exact circle it pressed into my palm. The sensation of a very small and at the same time extremely heavy object produced a disagreeable impression of repugnance and fear. One of the local men suggested we throw it into the swollen river; Amorim acquired it for a few pesos. No one knew anything about the dead man, except that “he came from the border.” These small, very heavy cones (made from a metal which is not of this world) are images of the divinity in certain regions of Tlön. Here I bring the personal part of my narrative to a close. The rest is in the memory (if not in the hopes or fears) of all my readers. Let it suffice for me to recall or mention the following facts, with a mere brevity of words which the reflective recollection of all will enrich or amplify. 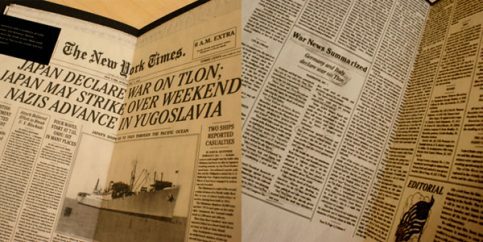 Around 1944, a person doing research for the newspaper The American (of Nashville, Tennessee) brought to light in a Memphis library the forty volumes of the First Encyclopedia of Tlön. Even today there is a controversy over whether this discovery was accidental or whether it was permitted by the directors of the still nebulous Orbis Tertius. The latter is most likely. Some of the incredible aspects of the Eleventh Volume (for example, the multiplication of thehrönir) have been eliminated or attenuated in the Memphis copies; it is reasonable to imagine that these omissions follow the plan of exhibiting a world which is not too incompatible with the real world. The dissemination of objects from Tlön over different countries would complement this plan. . . . 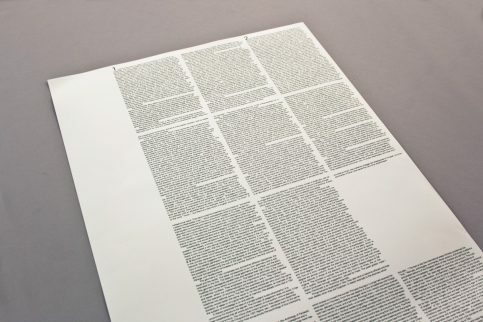 The fact is that the international press infinitely proclaimed the “find.” Manuals, anthologies, summaries, literal versions, authorized re-editions and pirated editions of the Greatest Work of Man flooded and still flood the earth. Almost immediately, reality yielded on more than one account. The truth is that it longed to yield. Ten years ago any symmetry with a resemblance of order—dialectical materialism, anti-Semitism, Nazism—was sufficient to entrance the minds of men. How could one do other than submit to Tlön, to the minute and vast evidence of an orderly plant? It is useless to answer that reality is also orderly. Perhaps it is, but in accordance with divine laws—I translate: inhuman laws—which we never quite grasp. Tlön is surely a labyrinth, but it is a labyrinth devised by men, a labyrinth destined to be deciphered by men. The contact and the habit of Tlön have disintegrated this world. Enchanted by its rigor, humanity forgets over and again that it is a rigor of chess masters, not of angels. Already the schools have been invaded by the (conjectural) “primitive language” of Tlön; already the teaching of its harmonious history (filled with moving episodes) has wiped out the one which governed in my childhood; already a fictitious past occupies in our memories the place of another, a past of which we know nothing with certainty—not even a that it is false. Numismatology, pharmacology and archeology have been reformed. I understand that biology and mathematics also await their avatars. . . . A scattered dynasty of solitary men has changed the face of the world. Their task continues. If our forecasts are not in error, a hundred years from now someone will discover the hundred volumes of the Second Encyclopedia of Tlön. Then English and French and mere Spanish will disappear from the globe. The world will be Tlön. I pay no attention to all this and go on revising, in the still days at the Adrogue hotel, an uncertain Quevedian translation (which I do not intend to publish) of Browne’s Urn Burial. 1. Haslam has also published A General History of Labyrinths. 2. Russell (The Analysis of Mind, 1921, page 159) supposes that the planet has been created a few minutes ago, furnished with a humanity that “remembers” an illusory past. 3. A century, according to the duodecimal system, signifies a period of a hundred and forty-four years. 4. Today, one of the churches of Tlön Platonically maintains that a certain pain, a certain greenish tint of yellow, a certain temperature, a certain sound, are the only reality. All men, in the vertiginous moment of coitus, are the same man. All men who repeat a line from Shakespeare are William Shakespeare. 5. There remains, of course, the problem of the material of some objects. Posted by world.pulse on 24. August 2016.. Filed under Borges,Literature. You can follow any responses to this entry through the RSS 2.0. Both comments and pings are currently closed.